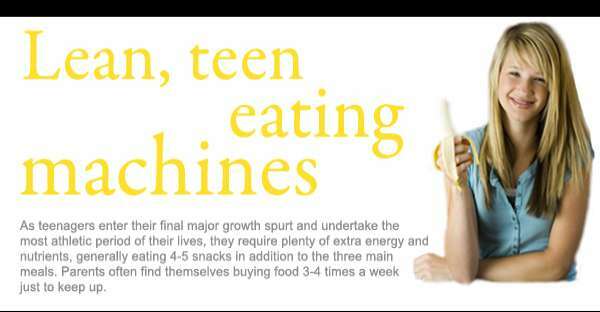 Why Do Teenagers Eat So Much? Answers! If you’re a mom who’s raising a teenager at home, don’t fret. Don’t go crazy when you know you’ve just gone to the grocery and just a day after, you open the refrigerator and you find all your stocks gone. Don’t go crazy. It is normal for teenagers to eat a lot. It is what the experts call “the peak of their growth spurt.” The U.S. National Institute of Child Health and Human Development say it is usually experienced during late puberty, where they are “putting on height and muscle mass” at the maximum level. In fact, a new study suggests that teenage boys reach their peak of eating, amounting to 2,000 lunchtime calories per day. Aside from the growth spurt peak, teenagers are also exceptionally active during this stage. They engage in so many activities in school, with their friends, in sports that require more energy from them than the usual. Because they are in the experimenting stage and because they are, most of the time, stressed in all their activities, they tend to eat a lot of chocolates, sweets and junk food. They are at a stage where they don’t think too much about what they eat. They just want to eat a lot, that’s all. So, if you’re a mom who handles the meals of your teenager kids, you have to really be wise with your food preparations. You have to be creative in such a way that what you’re letting them eat is delicious and in accordance to their taste, without necessarily sacrificing the nutrients. Nutrition dieticians suggest moms like you to prepare bananas as they are good for potassium. This will be a big help to boost the mental toughness and brain power of your teenage kids, especially now that they’re dealing with a lot in school. It is also good for those who are sports-minded, as bananas increase and boost a person’s endurance. A quick mix of banana, orange juice, and two scoops of lemon sorbet in a blender is a good snack to prepare for your kids. This is one example of a quick snack that is delicious, nutritious and exciting for teenage kids!